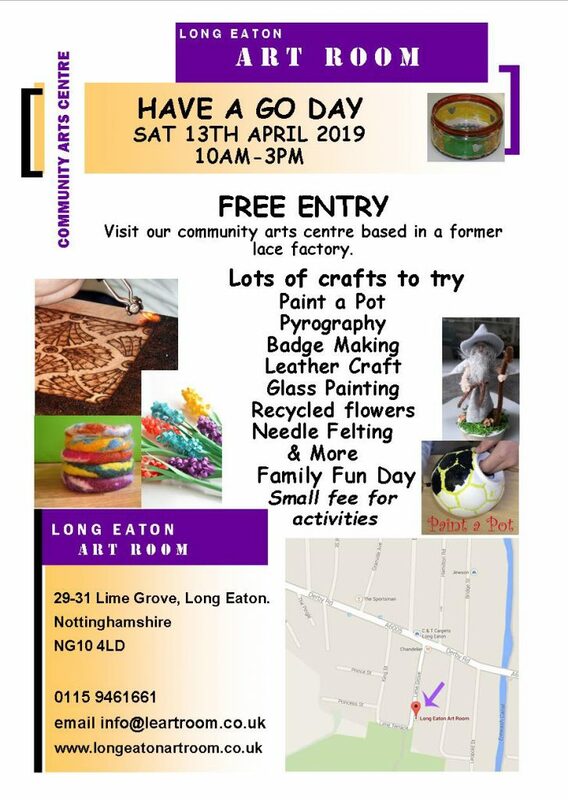 Long Eaton Art Room turns 13 in April 2019. Entry will be free for all but there will be a small fee for all activities to cover materials costs. All funds raised will go towards essential building renovations. Refreshments will be available all day. Fully accessible to all for the open day. 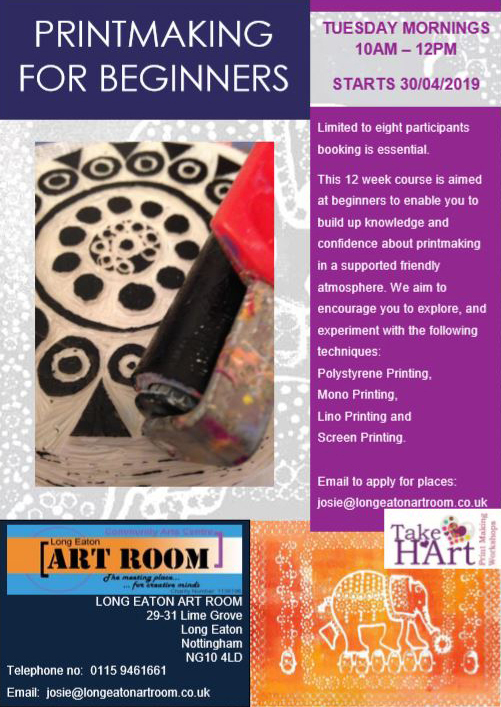 We have received funding from HEN to run 12 sessions on printmaking with an emphasis on wellbeing. Limited to eight participants booking is essential. We are looking for participants who can commit to all 12 sessions and will benefit from the therapeutic aspects of arts work with a view to those who have enjoyed the workshops possibly continuing the journey in paid sessions after the free 12 sessions end. We are selling off some of our stocks of fabric to help fundraise towards building renovations. Over the summer holiday one of our resident artists will be delivering drop in printmaking workshops. These are aimed at ages 3-11. All children must be accompanied by a responsible adult at all times. Places are £5 per participant per session. We are now taking bookings for our summer holiday workshops. These are open to all ages and abilities unless stated otherwise. Children must be accompanied by a responsible adult at all times. Its free to accompany a child unless you want to participate. Adults are not only welcome but encouraged to have a go at the workshops themselves too. Places are limited to 10 so booking is essential. Our Friday club will not be running on Friday the 13th and the Friday 20th July due to holidays. Our funding for the free craft club (Feel Good Fridays) has ended. However the craft club was such a success that we as an organisation have made the decision to continue with the club using our own fundraising activities and donations. The Sessions will continue to be available to anyone who might benefit from the therapeutic aspects of the craft club. Sessions are Free but we suggest a donation of £2.50 per session towards materials. Our craft club is called Feel Good Fridays. The craft club is open to all ages and abilities, everyone is welcome to attend but places will be limited to 15. We have seen how much impact arts and crafts can have on peoples wellbeing and mental health. If you are feeling lonely, isolated, if you have been struggling with anxiety, depression or just want to meet people or craft in company then this is the club for you. The club runs in our teaching room here at Long Eaton Art Room. We are fully accessible, heated and have air conditioning. Refreshments will be available during the club. We cover a different craft each week which will be taught by a professional artist. All materials will be provided, donations towards materials will be gratefully appreciated but not formally necessary. Children and vulnerable adults will need to be accompanied by a responsible adult. If you would like to attend and have questions please do get in touch. 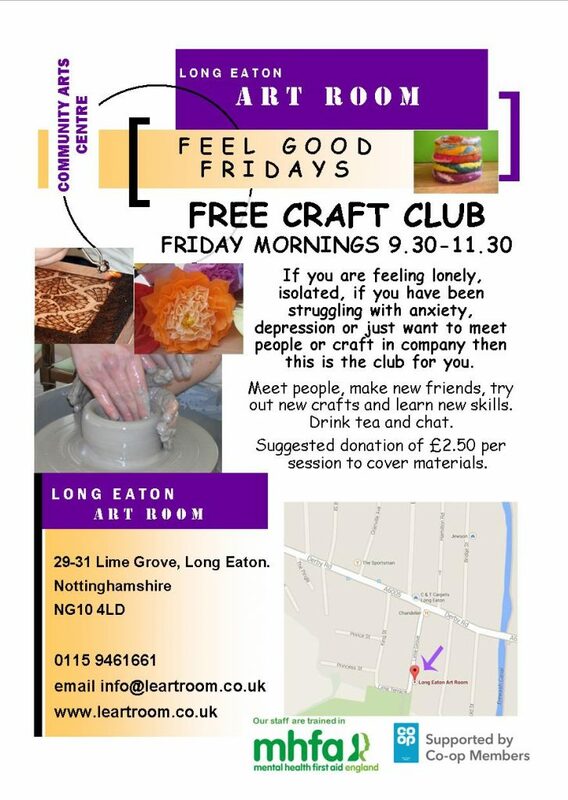 If you know someone who would benefit from coming to our Friday craft club please pass on our details. Sessions are Free but we suggest a donation of £2.50 per session towards materials. 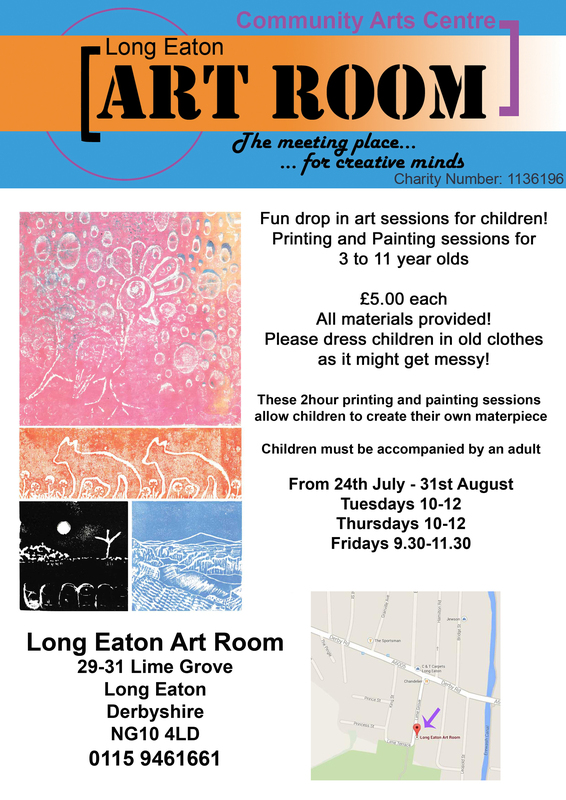 Hi, we have a creative job opportunity here at Long Eaton Art Room. We are looking for a Studio Session Supervisor, the role is being split into a job-share with two part-time job roles available at 16 hours per week each. The closing date for this role is 31st January 2018. We aim to interview Tuesday February 13th 2018. Long Eaton Art Room is a community based arts organisation which is located on Lime Grove in Long Eaton. It is a Registered Charity that aims to provide facilities for the public in the Borough of Erewash and surrounding areas to engage in creative arts, with the main aim to improve people’s confidence, self-esteem, health and wellbeing, creating stronger communities through the medium of arts and crafts. We are open to all members of the community, providing affordable artist’s studio spaces; a safe, supported venue to learn and develop skills; exhibition space and opportunities for social engagement. Facilitating our open studio sessions, ensuring all session participants (customers) are assisted according to their needs regarding the location and accessing of materials, setting up and clearing away of their projects, giving assistance, help and advice on activities and methods and trouble-shooting if problems arise. Keeping the Art Room spaces inside and outside of the buildings, clean, tidy, and free from health and safety hazards. This includes vacuuming, sweeping, wiping surfaces and cleaning the toilet and kitchen areas. Facilitating workshop rentals including arranging furniture to suit, providing access to resources and cleaning the space after use. Providing administrative assistance to the centre manager dealing with phone calls, enquiries, keeping handbooks and paperwork up to date. Dealing with cash, till receipts and invoices and doing the banking weekly. In addition to the duties detailed in the job description, you will also be expected to perform any other reasonable tasks assigned by the centre manager. 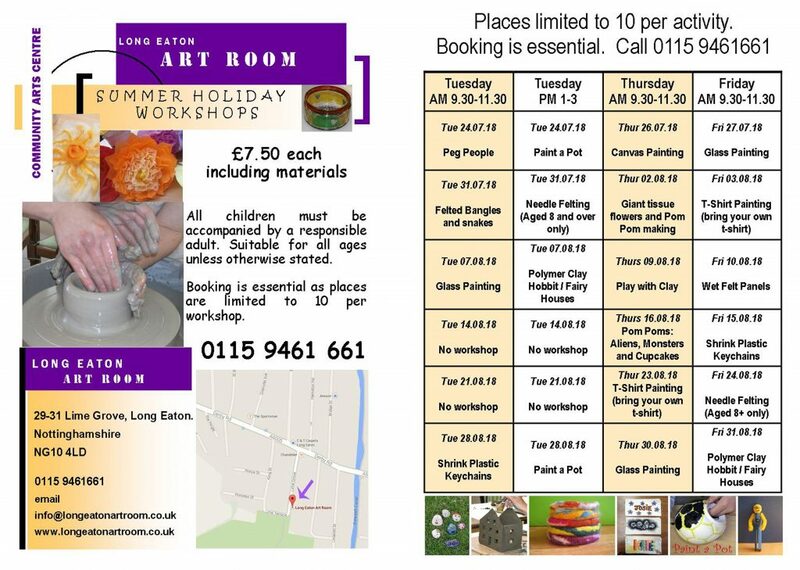 The job is based in Long Eaton Art Room but on occasion you may be required to travel to other locations/work elsewhere. Please apply in writing (email or hard copy) including a CV and a covering letter stating why you think you would be suitable for the post. Your CV should include your previous employment history, qualifications and experience relevant to the post. Please take into account in your application the personal characteristics and the essential and desirable criteria identified for the post.